A few weeks ago I wrote about my new credit card approval for the Barclaycard Arrival Plus® World Elite Mastercard®. It was actually the first credit card I applied for in awhile, but by far the best choice for me for right now. The card offers 70,000 miles after spending $5,000 within the 90 days and the miles can be used for anything travel related. I was personally looking for cards that would pay for some ski trips since there aren’t many chain hotels in the Northeast allowing me to redeem for a free night stay at a mountain. Since these miles can essentially erase purchases at Expedia (and many other travel sites! ), I was able to book a weekend getaway to New Hampshire, stay just a half a mile from the mountain, and have these points cover the hotel (while still being left with a ton of miles to use on a future travel purchase!). With that blog post I received a ton of great questions from many readers which I think you might all find valuable. Since this isn’t your typical points and miles card tied to a certain hotel or airline, it can sometimes be confusing. But the real benefit is that you can use the miles on purchases where you typically would not be able to redeem your normal points or miles. Staying close to the hotel (for free) thanks to Barclaycard miles! 1. If I’ve applied for a bunch of credit cards over the past few years, will I still get approved? Barclaycard is one credit card company that doesn’t have any set rules, but many data points. They have what many people call the “6/24” rule where if you’ve applied for 6 or more cards (from other credit card companies included) within the past 24 months you may not get approved. Unlike Chase, this is no hard set rule, but many folks have been denied after the 6 credit card mark for having too many credit card approvals. With that being said, there are also data points of folks getting approved for the card despite being over the magical number 6 limit. Feel free to leave your experience in the comments section below! 2. I applied for the Arrival Plus Card 2+ years ago, can I apply again? Again, Barclaycard does not have any hard set rule. The terms do state that you may not be eligible if you’ve had the card in the past, so your specific experience will definitely vary. I personally recommend waiting at least 6 months since you’ve cancelled the card to re-apply. 3. How do I redeem for purchases under $100 if you must redeem 10,000 points at a minimum? With this card, you have 120 days to redeem your travel purchases for a statement credit. It is incredibly easy to do online or you can always call your card to have them do it for you. Every penny spent requires 1 mile redemption, but you must redeem a minimum of 10,000 miles. One work around to get a purchase less than $100 covered is to buy gift cards directly from the merchant. For example, if you are looking to use the credits towards Ubers, then purchase a $100 Uber gift card. Apply the $100 gift card to your Uber account and you can then redeem your miles on that $100 gift card purchase. Same applies for airfare purchases that are less than $100. If you frequently purchase $79 American Airline flights, for example, purchase American Airline gift cards in $100 increments and then use the gift card to pay for your ticket. These miles can be applied to airline gift cards as long as you purchased them directly through the airlines website (it will not work if you purchase them at a 3rd party merchant, such as Staples or Target, or through Barclaycard directly). 4. If I’ve had a different Barclaycard credit card in the past, am I eligible to apply for this card? Yes, you are able to get more than one Barclaycard credit card, but they are known to look at your spend with their cards to determine whether or not they should approve you for another new card. If you do have any Barclaycards that have been sitting in your sock draw, make sure to take them out and start using them a little bit for a few months before applying for this card. 5. I received this card recently with a lower sign up offer, will they match me? It depends! They will not automatically upgrade your offer, but you should always reach out to them and ask. Try calling them and sending them a secure message via your online account. Most likely they will escalate your request to another department and get back to you within a week or two. The results are definitely mixed, but it is absolutely worth trying. 6. 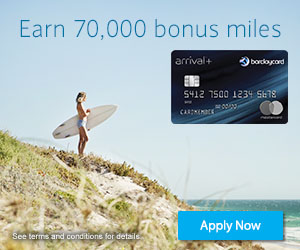 If I end up canceling my card, what happens to the miles earned? Since the miles earned are tied directly to the card, there is no way to use your miles after you cancel the card. This is different then your traditional points and miles co-branded credit card when the points are transferred to your loyalty account. You’ll want to make sure to use all of the miles prior to canceling! 7. Am I able to get a better offer than 70,000 miles? As of right now, this is the best offer we’ve ever seen for the card. I personally do not think you’ll find a higher offer since the normal offer is usually between 40,000-60,000 miles. 8. If I wasn’t approved right away, any way to get approved? Absolutely, although keep in mind that this card is definitely not easy to get approved for if you were denied, but it is always worth a shot. You can call their reconsideration line at 866-408-4064. Feel free to comment below with your results! This is great offer and definitely a recommended card for those looking for a quick way to get $700+ worth of travel paid for. Some great examples on using these miles include: Disney tickets, Expedia hotels, Uber/Lyft, cruises, car rentals, tours, AirBnBs, etc. I personally love having a mix of flexible point currencies along with your traditional hotel and airline points/miles. The combo allows for me reduce my overall travel costs no matter where I am going!